We were sent some photos of a pair of Gravity Falls customs by Joshua Pirtle from Kissimmee, Fl. Gravity Falls is a Disney Channel cartoon and these vinyls feature the main characters. 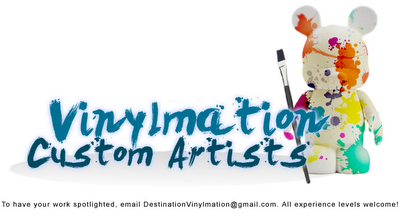 Destination Vinylmation: What got you into painting Vinylmation? 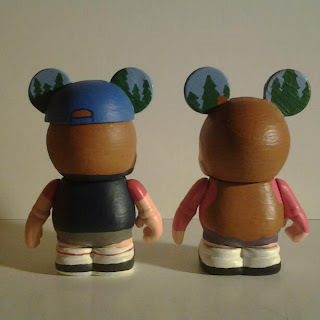 Joshua: Back when I started collecting with Park Series 2, I really wanted Vinylmation of two of my favorite characters Donald Duck and Oswald the Lucky Rabbit. So I got two blanks and that’s when it all began. DV: How did you decide to choose Gravity Falls as the subject of these customs? Joshua: I was watching the show one day and was thinking that Vinylmation of these two characters would be great. Especially now that there was a mold that had a baseball cap. Where do the blank vinyls come from for these customs? I know the old mold had the plain vinyls that you could customize but not sure about the new mold. Thanks! They do make new mold CYOs now, but many custom artists just paint over existing figures. I painted over a Mascots Mickey for Dipper and an NFL one for Mabel. These are amazing…. Disney needs to put more stock into this IP. No love for Gravity Falls in terms of merch. Great job on these though.